Summary: Searches are invasive and threatening. Under many nations’ rules of law, the police must show cause and obtain warrants before being able to search people or their dwellings. Only a few very special circumstances are normally allowed as exceptions. Yes, we are terrified that our Creator sees, knows, and abhors our every sin of thought, word, or deed. Yet, yes, we also celebrate His intimate knowledge of us because He knows us not from as distance but as one of us. In human flesh He carried our sins in His own body and died that we might live. 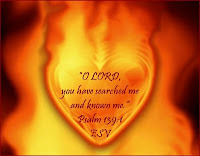 Text: O Lord, you have searched me and known me! You know when I sit down and when I rise up; you discern my thoughts from afar. You search out my path and my lying down and are acquainted with all my ways. Even before a word is on my tongue, behold, O Lord, you know it altogether. You hem me in, behind and before, and lay your hand upon me. Such knowledge is too wonderful for me; it is high; I cannot attain it. Audio: Click to hear the MP3 of Searched and Known, preached at early service to the saints of God at Our Redeemer Lutheran Church, Marshall, Missouri.